Many rumors and misconceptions exist in the amateur radio world about stacking VHF/UHF antennas on the same mast. I have heard all sorts of warnings about screwing up the performance of my yagis by mounting them in a compact fashion on my rover masts. I have been modeling antennas using NEC2, and I am here to tell you that you can really get away with alot, and still maintain good antenna performance. For example, I am considering adding a medium-sized 2m beam (12-15ft length) on my rear mast, just below the 432 yagi. I wanted to know how close together these yagis could get before the 432 gain went to hell. Well, I found that I could safely stack them, at a distance of only 2ft, and only lose about 0.5dB of forward gain!! ...and the pattern is still very good! This is a pleasant surprise. I always suspected this, from previous experiments, but I wanted some computer modeling to really convince me it was OK...well...guess what...IT IS...JUST DO IT! I have always been pleasantly surprised, when I have stacked yagis close together. You don't need to worry about that old ARRL VHF handbook recommendation of "half-the-boom-length" of the upper yagi. Ed Tilton was a great guy, but he was also pretty conservative about antenna stacking (and he didn't have computer modeling like we have today). You will notice only about 0.5dB degradation! Not too bad, considering the extra rover-ERP-squirt you will get! I plan to do a lot more studies along these lines, and I will publish my findings here, if there is any interest. 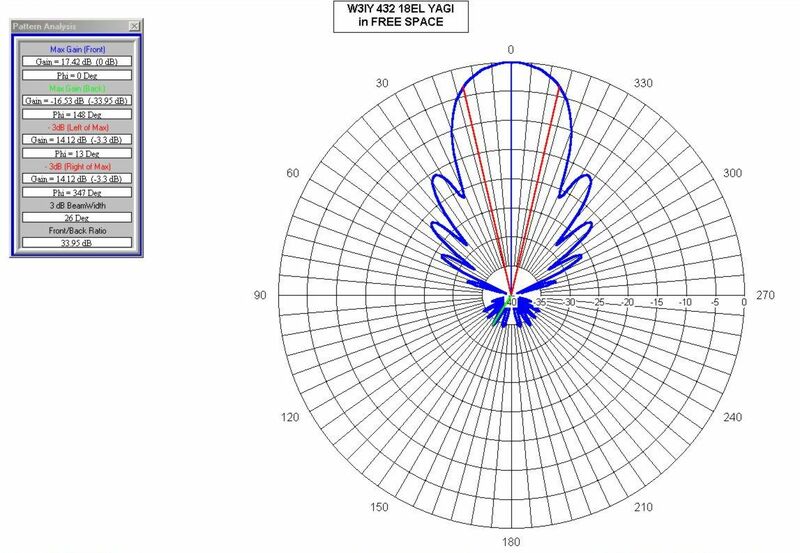 For example, I am going to model my front mast, which has a 6-meter halo on top, a 5el 2-meter yagi, and a 222 MHz yagi, all pretty close together. Loop yagis are off-limits...unless I can model them as rods...which makes sense. They require more exotic 3D EM software (and hardware) than I have access to. Loop yagis are wonderful...it's just that nobody has yet completely optimized them, and they are typically 1 or more dB below the performance of an equivalent rod-type yagi. They do have other advantages, though, like being easy to get working, and being more tolerant of construction anomalies. Watch out for low hanging tree branches, however...loop yagis are much harder to repair if you hit trees with them, which will probably happen if you do a lot of roving. Many 1296 yagi designs are fine, but then get screwed up when the unsuspecting builder applies the wrong boom correction factor to the element lengths...beware! You cannot use the accepted DL6WU/G3SEK boom correction factors for booms greater than 0.5in or so at 1296 MHz. A strange non-linearity occurs with these electrically large booms, and the correction factor actually shrinks to zero at around 1.0in boom diameter at 1296. The effect of the boom changes from a shunt inductance at the boom center to a capactive end-loading effect as the booms grows larger than 0.5in, and at some point around 1.0in diameter, these opposing effects cancel each other completely. I have verified this using a network analyzer, and I hope to find time to generate some useable graphs on the subject. I would be greatly interested in hearing from anyone with experience using these larger booms at 903, 1296 MHz, or above. You don't want to spend a weekend drilling holes, and filing elements just to find out you built a dummy load. If you have the time and inclination, consider building several prototypes with fewer elements, to verify your element correction factor, before embarking on the 144 element long-long microwave yagi. If you can measure gain vs frequency, you should be able to assess the validity of your element lengths. It can be very hard to match a 1296 yagi, even when the element lengths are correct. 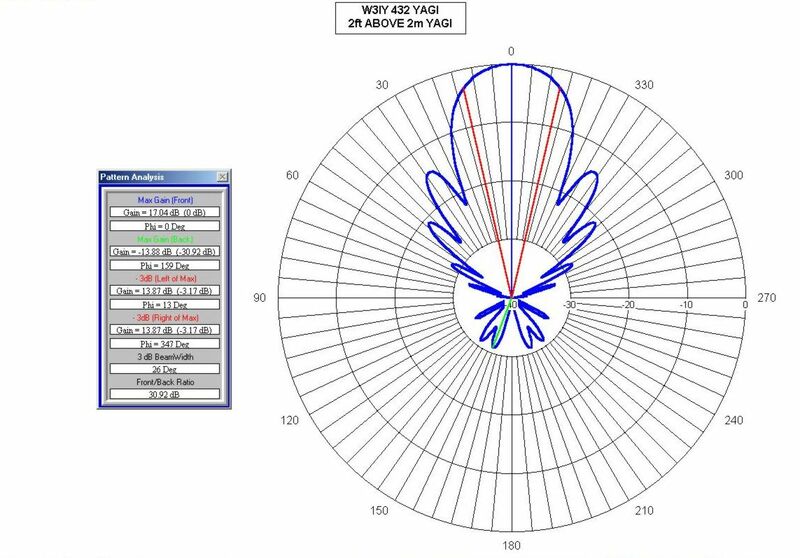 The DL6WU yagi design algorithm seems to produce a good match to a folded dipole, from my experience. Even folded dipoles can be difficult to build without excessive parasitic reactances at 1296 MHz.